Super Program and Winder ME II - not working, is it the camera or the winder (or me)? Have had my Super Program for a few months now and really enjoy it. It was CLA'ed when purchased and came with the AF200T. Purchased some add on's since. Motor drive "A" (neatest thing since sliced bread). Digital data "M" (will see if it worked when I use up this roll and send it in for processing). O-ME53 magnifier eye cup (really helps with the split prism to nail the focus especially with these older eyes). Have only used it in auto mode with the lenses in Auto mode and it works perfectly with the Sigma 28~70, Pentax A 35~105. Current test lens is the Pentax A 70~210 and that roll should be used up by this weekend, maybe. Clarence - thanks for the pics with the AF280T. I just got the magnifying eye cup too, didn't realize I could put it on the Super Program, I'll have to try it. I thought the Motor Drive A would be too big and heavy, but it does look nice in your photo. Never mind! The problem was not the camera nor the winder - it was me! It is working fine now. 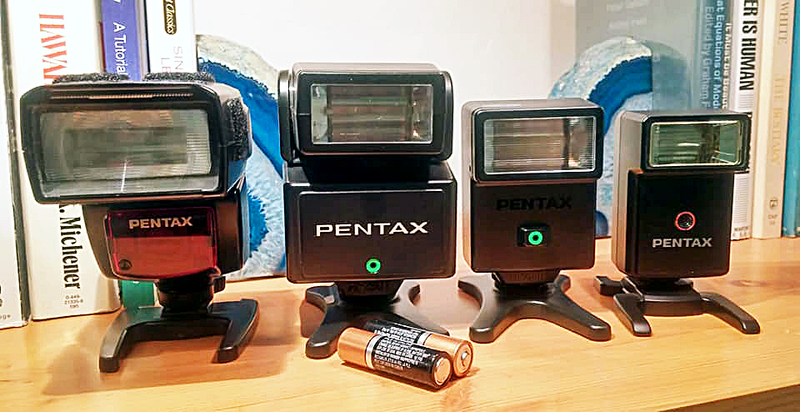 I searched the Pentax Forum a second time for any issues related to the winder. I found a thread called "The goofiest winder ever? ME Winder II" from 2014, and in that thread "Stevebrot" noted that the body grip on the front of the Super Program must be removed before attaching the Winder ME II. Otherwise there is a very slight misalignment that can prevent it from working. I must have missed that comment the first time I checked the forum. All it took to fix my problem was a penny - I used that to remove the body grip, then re-attached the winder and Voila! Problem solved. Now when the trigger is pushed on the winder the camera shutter is first tripped, and then the film is wound. Funny, the need to remove the body grip is not mentioned in either of the two manuals. The misalignment must have been very slight, as I did check several times to see if the winder seemed to be snug up against the baseplate, and I judged it was. Thanks for your post.. You just saved me from writing a letter to the seller I bought the winder from suggesting there might be something wrong with it. Funny thing is when i had it on the camera with the grip I suspected it was too close for comfort. Removed the grip (in my camera bag zippered compartment) and it is working as it should. I'm glad my post helped you, as other people's posts have helped me as well. That is what is great about this forum, right? Yes, the motor drive does fit on the camera pretty well with the grip attached, but there is just that tiny bit of interference that must prevent some connection from being made correctly. I only shot a couple pictures using the drive when I did my test roll in the camera. Next time I'll try using it more, it does add some weight and bulk but I do like the feel of the camera with the drive. However, I also just got a battery grip for my MZ-S, so I think my next roll will be with that one! I'm sorry to hear you had a bad purchase. Won't they take it back? I am liking my MZ-S, just developed a test roll of HP5 shot at EI100, using the battery grip BG-10 I recently got. I got my MZ-S from a dealer in Japan, through Ebay, and it was tested and guaranteed (though return shipping from Chicago to Japan would have been very expensive if I did have to return it.) Perhaps you can send yours out for a CLA (such as to Eric Hendrickson in the US) and the problem can be fixed? Also, I understand the camera uses some kind of infrared sensor inside the film compartment to detect film motion - perhaps that sensor is dirty and that is causing the problem? Thank you for replying. I was able to send the camera to an old time film camera tech and he fixed it for me. I shot my first roll of slide film and am expecting them this week. I am eager to see the results with the limited lenses that I used with the MZ-S. Seemed like a perfect marriage of lens to film body. I really appreciate your advice. Eric said he couldn't do anything but I found someone in Jersey. Working fine now. That's great news. Who did you send it to? Just in case mine needs service some day. How did you pictures turn out? I recently got the SMC Pentax-FA 24-90mm F3.5-4.5 AL [IF] lens that was released with the MZ-S, and it is indeed very nice on the MZ-S body, but cost me almost as much as I paid for the camera since this is a hard to find lens. The difference between 28mm of many zooms and the 24mm on this one is noticeable. And I really like the feel of the BG-10 grip with this body - another pricey accessory, but I think worth it. I found my inexpensive aftermarket IR remote works great with the grip too. And, my latest find was a Pentax Release Timer Switch TS-110 from KEH for only $16 including shipping, sold "untested as-is." I figured that since this remote only works with the MZ-S and 645N they probably couldn't easily test it - and I was right! It works great. I'm hoping to get a 645N too some day. If only I could find an MZ-S printed manual, I think my "accessory" list would be complete. Here is a test roll I shot with the MZ-S. I've taken more since then, but I'm behind on uploading to Flickr. 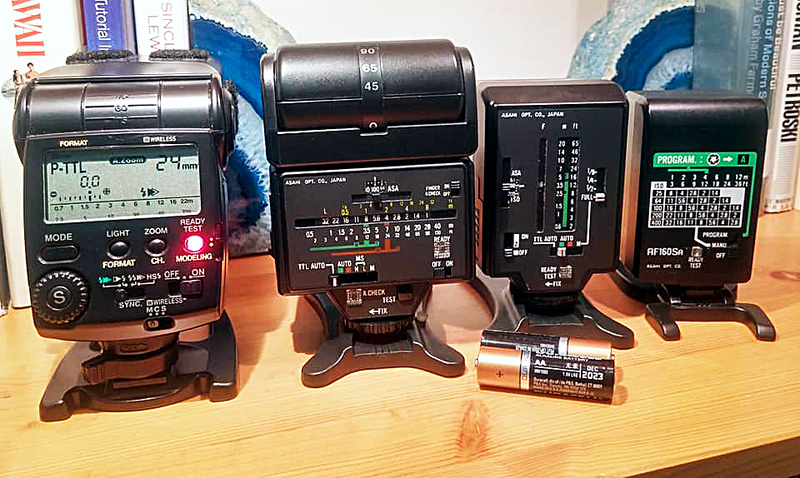 Just wanted to add to this old thread - I did eventually get more flashes for my Super Program - I now have the AF360FGZ (autozoom, bounce, P-TTL, TTL, Auto, and manual), the AF280T (bounce and swivel, TTL, Auto, manual), the AF200T (TTL, auto, manual), and the AF160SA (auto, manual). All give automatic exposure with all my Pentax cameras, both film and digital (except for the Spotmatic, no hot shoe, so I use my old Vivitar Auto 252 with that one). Caption Pentax flashes. AF360FGZ, AF280T, AF200T, and AF160SA. All give automatic exposure with all my Pentax cameras, both film and digital. Except for the Spotmatic, no hot shoe.